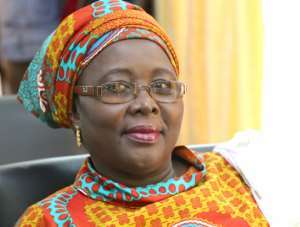 Kuala Lumpur, Feb. 13, GNA - Hajia Alima Mahama, Minister of Local Government and Rural Development, says Ghana is poised to take advantage of growing urbanisation of the country which was about 52 percent. She said planning was an important tool for Ghana and that urbanisation should be welcomed to link up with industrial planning, adding that, 'what Ghana needs to do is to enhance her capacity in the area of urban planning and creating of services and jobs'. Hajia Mahama was speaking at a high-level meeting on a panel discussion with representatives from the European Commission, African Union, China, World Bank, among others on the theme: 'Urbanisation and Development: Investing in Transformative Force of Cities' at the World Urban Forum (WUF 9) in Kuala Lumpur, Malaysia. 'We should not be afraid of migration; we should not be afraid of urbanisation,' she declared. Hajia Mahama who led Ghana's delegation to the WUF9 said, planning should be done to ensure that it took advantage of every situation and there was the need to discourage slums as they created social nuisance and urbanisation would transform the country's economy. Other members of the delegation were; Nana Boateng Agyei and Mr Robert Ahomka-Lindsay, a Deputy Local Government Minister and a Deputy Trade and Industry Minister, respectively, Mr Felix Mensah Nii Annang-La, Tema Metropolitan Assembly Chief Executive and National President of NALAG, as well as some MMDCEs and officials. The WUF9 is the key platform to discuss the implementation of the New Urban Agenda and the urban dimension of the Sustainable Development Goals (SDGs) and it is one of the most open gatherings in the international arena. It mobilises urban actors in national governments, sub-national and local governments, civil society, private sector and academia to share knowledge and solutions for sustainable urban development; facilitate stakeholders' inputs to monitoring and reporting on the New Urban Agenda and facilitate strong multi-stakeholder partnerships. The New Urban Agenda was adopted in October 2016 at the United Nations Conference on Housing and Sustainable Urban Development - Habitat III in Quito, Ecuador and was a result of a unique consensus among all participating states. The document sets out a common vision and global standards for urban development in the coming decades and comes at a critical moment, when for the first time in history, over half of the world's population is residing in cities. The WUF9 which is on the theme: 'Cities 2030, Cities for All: Implementing the New Urban Agenda' will place the forum's focus on the New Urban Agenda as a tool and accelerator for achieving Agenda 2030 and the SDGs. The New Urban Agenda lays out the vision for future cities based on the science of urban development providing tools in crucial areas and the WUF was created in 2002 to bring countries together to discuss issues that were critical to the management of urban areas through a sustainable urban development and cities.